I'd stay to faction text. Less clutter is pleasant to see, but i think that the faction text area is not what made the card look "busy". If you keep it, then you should move the faction logo on the same side. 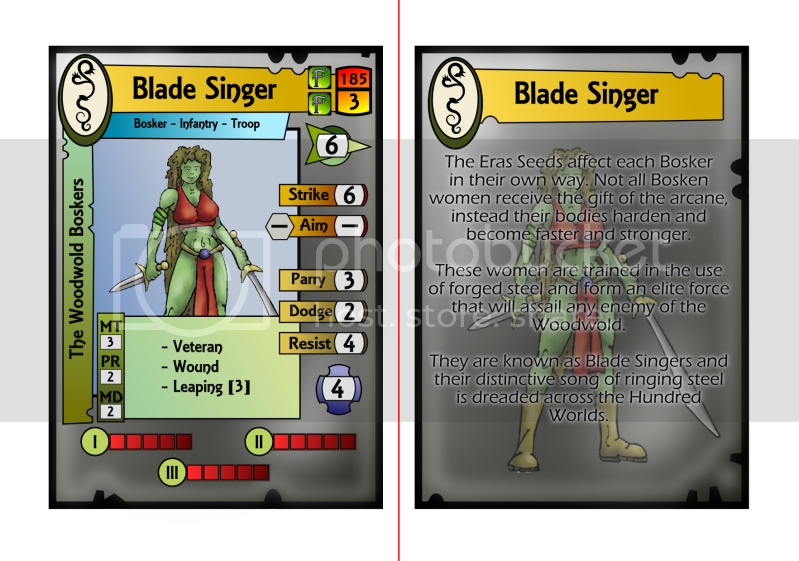 The forces building info (faction, name, type, point, allotment and the die pool symbols that I left off of the first drafts of the card) all appear in close proximity. The green arrowish icon is the speed, strike and aim are grouped as attacks, defenses are grouped, and the blue oval/cross icon is mettle. This is a little roomier and also puts the stats into somewhat of an order that follows the game (move, fight, mettle). Please let me know if you think I am on the right track. I realize that I am back to the plain old gradient fill, but I’ll work on prettying it up again when the layout is right. But i think that you have to make a choice: icons, or text, for the stats? Imho, the only thing that may feel wrong is mixing the two ways to show the stats. I really like the changes you've made. I am thinking Parduz is correct with the text vs. icon thing... might want to play around with that for a while... kind of like the Warlord CCG does. Obviously you have a bit more stats, but you have gotten the general gist of what I was going for! After looking at the new card i couldn't agree more about sticking with either text or icons. So here is a sample of both. The icons were just quickies to get an idea of what ti would look like, the actual icons are subject to change. I think if nothing else I would change them around to make the number larger and more prominent. I think, my friend, that that is it! I really like the icon only card! You've packed a LOT of info on it without being overwhelming! Now, all we need to do is grunge-ify it up a bit and I think we're good to go! At any rate, excellent job! I vote for icons. The only thing i'd do is "grouping" the related ones in some manner, but other than splitting icons in sectors i can't suggest how. I would like to get the icons grouped a little better as well, so that will be my next effort. Awesome, I hope I don't keep you waiting too long, though things are moving along pretty well right now. I finally had a chance to read all the way through Into The Fray and to roll a few dice to get a feel for it. The system has an elegant dice rolling mechanism that is used consistently, and the instructions are well written. The Mettle and Magic systems seem a little convoluted for me, but that may just be a matter of taste. It IS a skirmish game, after all. The counters and the status blocks look like they go a very long way toward making the information managable. It might do well to write a "quick start" set of rules, and possibly a scenario, that leaves out the Mettle and the Magic rules, and includes an extended example of play, so players can get a feel for how the basic game plays before tackling its more intricate features. The game seems to have a Runequest feel to it, which I like. It would be interesting to do some DragonPass skirmishing with it, though I think Mongoose has those rights at the moment. It will be interesting to see how things develop with new factions. Will there be monsters for dungeon crawl type skirmishes? Thanks! It is pretty easy to think up a game mechanic and jot down notes to play, but writing rules to make rules clear to those that have never played before is one of the toughest hings about making a game, for me anyway. I’ve gotten a bit of this reaction, but the few test games we’ve played tend to have the magic and mettle system play out pretty easily. I’m considering some pretty heavy edits to these two chapters to clear up the language which may make it seem more manageable, or as you suggest it is just a matter of preference. I went back and forth over the mettle rules, wanting some form of morale rules but not wanting something super complex, we’ll have to see how it works out during a proper playtesting. I’ve gotten this suggestion a lot as well. A final release of the game will feature some form of quick start rules, with no dice pools, magic or mettle. I never thought of including a scenario, but now that you metion it it seems like a no brainer . I’ll add this to the to do list, along with a lengthy example of play. The long example also seems to be in popular demand so that is on the list as well. I have so many ideas on where to take Into the Fray after its initial release. I have background material for both factions and a world to serve as the backdrop. 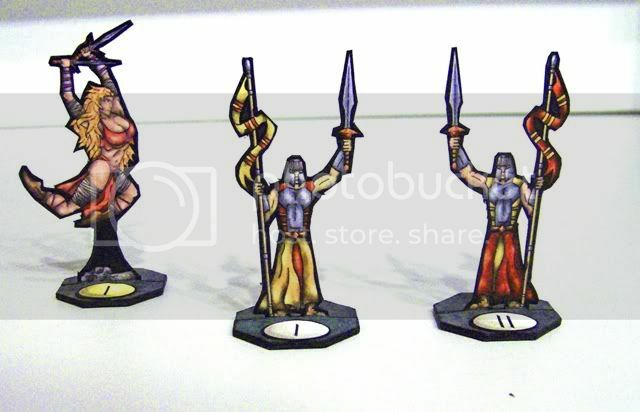 Initially I think the factions are plain enough to serve let the rules system shine, but have enough variety to make them stand out as more than simply foot soldier, archer, hero wizard…. Assuming the reaction is good enough to keep me working on it I plan to release two more factions ASAP. 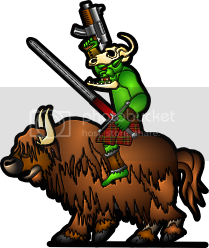 After that, I have thoughts about a mounts and monsters expansion (for mounted troops, swarms and giant units) as well as some kind of progressive scenario/campaign book. I have a pretty strong desire to offer a dungeon crawl version of ITF, something along the lines of a Heroquest or Descent. Even a near future edition or a zombie apocalypse edition have crossed my mind. Of course I’ve got to get this initial version up and running first. Rest assured as long as I have people interested in the game I will continue to produce material of some sort for it. So I worked on the icons a bit in between miniatures this weekend. 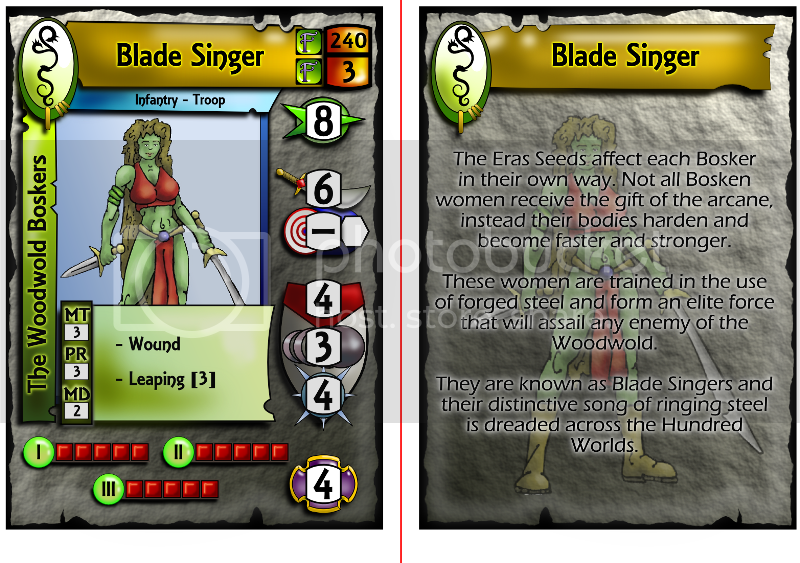 I took the grouping suggestion along with the split shield suggestion and think this may be the final version of the card (aside from dirtying, highlighting, shading and texturing). One concern that I have is that the inclusion of the large shield behind the defense stats introduces some of the clutter that I managed to cut out during earlier editions. Any thoughts, comments. Like it? Hate it? Imho, the new is LESS cluttered. I'm faster at seeking the number i want than the older one. My only suggestion (more of a how-would this-look thought) would be to move your aim stats so that the bullseye was in the center of the two stats like the revision before. I think this might make the card feel more balanced as all the other icons are lined up vertically as well. I don't think it's a matter of how the rules play out. It seems to me that they play out fairly easily. And it's not a matter of language. I think the Mettle and Magic rules are very well written. I think it's a matter trying to absorb so much information before being able to play the game. If people can internalize some of the basic rules by playing with them before introducing Mettle and Magic, then they don't feel like they have to digest too much before they can start rolling the dice and making the stories. Also, if you included a scenario with the quickstart rules, you could use situations from the scenario as examples, and the whole package would have an integrity to it! I used to write product descriptions and installation procedures in the insulation industry, so I know what you mean about verbalizing things that seem very simple to show in person. Very good work, Sammo, very good work, indeed! I think that I am committed now to making a quick start version with a scenario. If I decide to make ITF a for $$ product I may include a few units with the quick start rules and offer them for free as a sample to get people interested. Thanks for the suggestion. As for the target icon, I’m not happy with it either; I changed it so the numbers were all in line and now the target seems out of place… I’ll probably monkey with it some more. I really feel like I have to get the card right the first time, since I intended to make one card and fill in the blanks for each unit..so once I release it is likely to remain unchanged. Why not trying with a single "box", but a bit larger, so you can write inside something like [4M]? It should be easy to align a single cell. Faction and miniature design is my main focus now and they are coming along pretty well, though not terribly fast. Now that the card layout is more or less finalized I should be able to get the rest of this stuff put together relatively easily, as always finding time to work is the biggest obstacle. Glad you like the minis Reivaj! It looks like you have gotten a LOT of help and input on this so far, but if you need a fresh set of eyes, let me know! I love creating and playing games, so ANY help I could be would be greatly appreciated! After reading the rules, the cards make a lot of sense! I still think you should limit the amount of wounds multi-figure cards should have. Just my opinion. To quote Lord Vader, when I read this, and looked at the artwork, I couldn't help to think, "Impressive. Most impressive." First of all, thanks for all of the feedback. It has definitely all helped me figure out where I need to go to get people playing Into the Fray. I haven’t been on the forum much lately but rest assured, work is progressing as fast as I can get it done. Two more minis are done, faction building is just about complete and I even have a few cards ready to go. Thanks for your patience. Ideally a few more weeks will be all that is needed to get this game going. Here are the newest minis, just built them last night. It's not the best picture ever, but it'll give you an idea of how they look. It is that i don't have your phone number or your address to ask you 3 times per day when it will be ready! Hey, I am LEARNING to be patient! I waited for Parduz to consolidate the TRON Cycles for me that Scruff did. I got the file, and was WELL worth the wait! I know that this game will be AWESOME, I am VERY impressed so far, and that really is a BIG compliment, because I don't like MUCH. I am more interested in a SCI-FI setting (because that is 90% of where my interests lie)... but this is looking very cool! I’ve gotten my mini process more or less figured out, which means much less time once I get the sketch worked out until I have a completed mini. It still may not be the most efficient way to do it, but at least I am not redoing too much work because of errors (or trying to figure out how to do everything). The last to minis just got inked tonight, I’ll probably scan them in before I call it a night. Anyway, thanks for the compliments everyone. For those of you waiting to play…its getting close, the list of things to get done keeps shrinking. Though it bears mentioning I am heading into a pretty busy week but after that I see smooth sailing. I just finished up a big paper for school, and I am travelling for Thanksgiving, but other than that I am keeping my nose to the grindstone. Moving on to finish the spell lists, unit cards and one more mini and a handful of tiny things…getting pretty close now and I hope to have some extra time this week to keep things going.